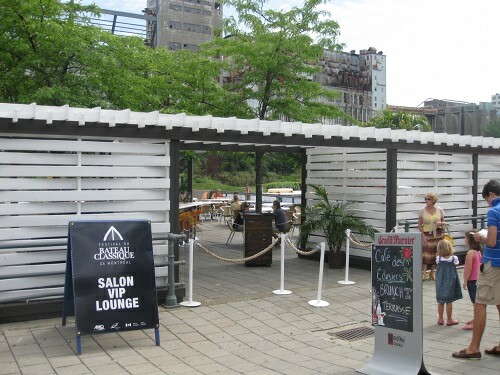 Known primarily as a spot for it’s “5 a 7” drinks in the Old Port, Café Les Eclusiers also offers a weekend Brunch, although not as fast paced and with music blaring alongside the sounds of drinks being poured and people relaxing after a long day of work. The weekend brunch takes advantage of the area along with it’s own unique setup and look. So, when looking for a nice spot to go eat brunch in the Old Port, Café Les Eclusiers seemed like an interesting choice especially since I was curious as to how a place can make the transition from busy after work drinks place to a more laid back weekend brunch. With that question in mind and two friends by my side, off we went to check out Café Les Eclusiers and see if it had come up with a winning formula to successfully do both. Situated in the Old Port, Café Les Eclusiers has a great location with a breathtaking view, an ideal combination for a sunny weekend brunch. With the docks right behind them and boats nearby, it really is something to see. That’s just what the outside has to offer. The inside is very open concept with two kinds of seating areas. 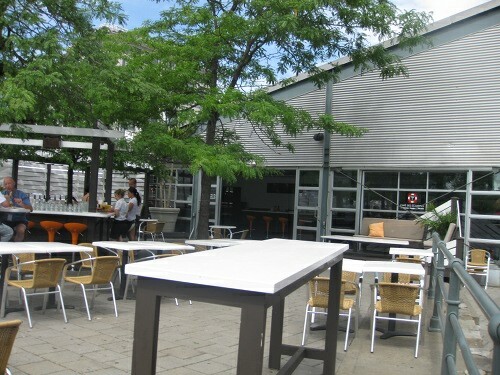 There is a nice large bar in the middle surrounded by small tables and chairs and there is a banquette-like area with low tables and cushion seats. Although the low tables are situated in some of the nicest areas and are comfortable, the cushions are a little neglected and slightly water damaged. The low table is not an easy table to use if you want to eat. Also, the spot where we sat seemed to be a favourite spot for bees, which was not that great. What’s more is that this place is fully wheelchair accessible, which is a very nice touch and shows thorough planning and attention to detail. The menu is a short one-pager where most items are in the $13-$14 price range. 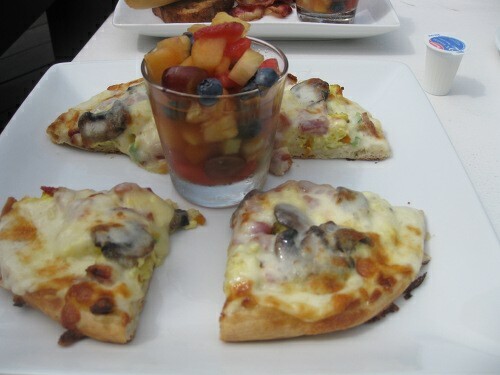 They have interesting items like a breakfast pizza ($13.00) which is not to be mistaken with morning after breakfast pizza – this one is scrambled eggs, grilled vegetables, mushrooms, mozzarella, and prosciutto with a fruit salad. There are some non-brunch items like the burger ($14.00) and nachos ($13.00) as well as some classic brunch options like French toast ($13.00) and Bael Mc Allister (13.00) which is essentially bagel and smoked salmon. They also have shrimp spring rolls ($8.00). The dishes do not come with coffee and it is $2.00 a pop. Sadly the coffee was not very impressive but you get free refills on the plus side. We ordered three items that were a mix of traditional and non-conventional. Primarily the breakfast pizza which was 4 slices of breakfast food on a pizza. I was worried that it would not be good and really tried to suppress my memories of morning after pizza which usually involve lots of heavy drinking and a disregard for anything else that is edible. However, to my enjoyment, this pizza was nice and light, quite cheesy but definitely breakfasty. It even with a fruit cup which was quite refreshing. My only issue was that the portion was small and if I had ordered that one as my main meal, I would have been hungry again right after. 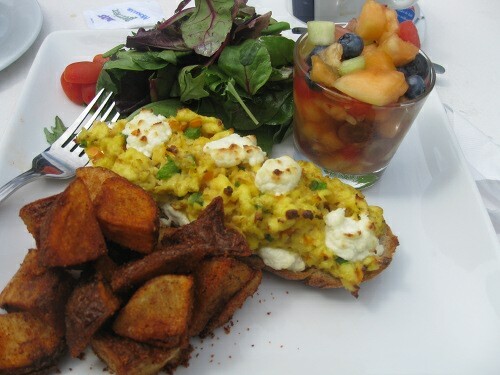 Next on the list was the Tartine ($13.00) which comprised of scrambled eggs, goat cheese, grilled vegetables all served on baguette bread with a side of salad and home-style potatoes. The goat cheese worked really well with the eggs although the vegetables seemed understated and more of them would have been better. The salad was good but the real star was the potatoes which were spiced well and very tasty. In fact, the more I ate them the better they tasted. The fruit cup it came with was also quite good and was a much appreciated addition to the plate. 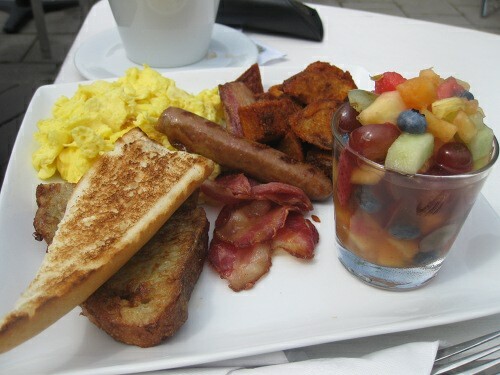 Lastly, the Brunch des Eclusiers ($14.00) came served with scrambled eggs, French toast, sausage, bacon, potatoes and a fruit cup. The scrambled eggs were exquisitely done and the potatoes were impressive as they were with the other dish bu the French toast was mediocre at best. This plate did offer a good bit of variety and the fruit cup as always is an appreciated addition. I did feel though that at $14 it was a touch pricey and it would have likely been about $12 if we were anywhere else. But, since the location is so nice ( it is, after all, the Old Port), I guess that’s where there extra money goes. The service was decent and our (flavour-lacking) coffee refills were frequent. Our waitress was nice as she passed by frequently enough but she did not leave enough milk and sugars which was kind of a pain to have to deal with. Most plates do not come with meat and some have fish if you are a pesco-vegetarian. As for vegan options there is a fruit plate (13.00) option with market fresh fruit. They do have a health dish at $12 which is vegetarian friendly and seems rather filling consisting of fruit, yogourt, almonds, granola, cheese, and a baguette. Overall I was not overly impressed. Granted, the location is nice but only on a really sunny day and the fact that we had bees all around us made for a constant annoyance to our meal. The prices are a little on the high side and considering you have to pay for coffee it makes it borderline overpriced, especially considering that the portion sizes are not that big. I do like the fact that it is fully wheelchair accessible which most places miss out on and the view is really nice. Menu highlights are the potatoes, fruit cup, and scrambled eggs. I feel that if they would rework the menu and add some more choice and increase the portion size, they could get that winning combination I had hoped to find when I went. Sat-Sun 11:00 a.m.- 13:00 p.m.